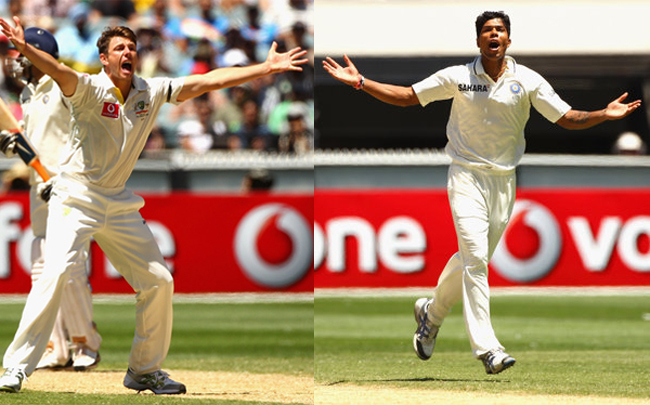 Two young speedsters James Pattinson and Umesh Yadav have erupted international cricket scene and they are face to face in the ongoing series between Australia and India. The first Test is being played at Melbourne Cricket Ground which has entered into an interesting stage by the close of the third day. Umesh Yadav has already made an impact by clinching five wickets in the second innings of Australia and he can add more to his tally as the hosts are eight wickets down at the moment. The youngster registered three wickets in the first innings which included the top order batsmen like David Warner, Shaun Marsh and Ricky Ponting. James Pattinson has shown the glimpse of his furious bowling by taking two wickets in the first innings of India but he will be focussed more in the second innings of India as the wicket is providing lot of assistance to the fast bowlers. We will highlight the emergence of two youngsters along with their brief career and future prospects. Umesh Tilak Yadav was born on October 25, 1987, a right arm fast bowler, right hand batsman who has played for India,Vidarbha and Delhi Daredevils. He belongs to a mediocre family but cricket fascinated him ever since he was a teenager. The 24-year-old has brought thrill in to the game by his speed aided by his accurate line and length and unpredictable bouncers. He became a horror for the batsmen while appearing in domestic cricket and his credentials were emminent in the first class matches. The right hander made his debut against Zimbabwe in One Day International on May 28, 2010 at Queens Sports Club, Bulawayo. He has played nine matches and took 11 wickets at an average of 38.90 runs per wicket with the best of 3 for 38. Yadav was handed over the Test cap on November 6, 2011, against West Indies and claimed two wickets in the match which India won by five wickets. He took part in two matches, got nine wickets averaging 21.22, the best of 4 for 80 runs in a match and 7 for 103 in a match. He has a lot of thrill and promise and the ongoing series will prove a milestone in his career as the wickets in Australia always assist the seamers. James Lee Pattinson was born on May 3, 1990, in Melbourne, Victoria, a right arm fast bowler and left hand batsman. He has played for Australia, Victoris Under-19’s. Australia Under-19’s, Kolkata Knight Riders, Victoria and Australia A. He is a true fast bowler produced by Australia after a long time and they can bank on him for the years to come. He started his cricket while representing Victoria Under-19’s in the domestic circuit and made an impact by his genuine fast bowling. He was picked up by the national selectors who shown their faith while keeping in view his talent. The 21-year-old made his debut against Bangladesh on April 13, 2011, took one wicket in the match which Australia won by 66 runs. He has played two ODI’s, claimed three wickets averaging 26.66 runs per wicket with the best of 2 for 41. He was honoured with the green baggy Australian Cap for Test cricket against New Zealand on December 1, 2011, at Brisbane. He was unplayable in the second innings by the Kiwi’s and grabbed five wickets for mere 27 runs as the visitors were bowled out at 150 runs. The Kangaroos won the match convincingly by nine wickets and was declared ‘Player of the match’. The fast bowler has played two Tests, clinched 14 wickets at an excellent average of 14.00, the best of 5 for 27 runs in an innings and 8 for 105 in a match. Pattinson will be the spearhead of the Australian attack in future but he will try to produce his lethal burst against India in their second innings of the first Test which can lead his side to a victory.